The current evolution speed of 3D printing technologies can provide a fairly accurate idea of the wide range of applications that can be covered; therefore, choosing the most appropriate solution is not always easy, so it is best to address its selection from the perspective of the needs of the consumers or as the end customers. This is the common approach applied in AIJU in every project presented to us. Thus, the main idea can be summarized by analysing carefully what the list of conditions to be considered as a need is, and based on them, choosing from the wide range of possibilities which solution can best meet all of them. Sometimes it can be simple, but in many other occasions it may not be so straightforward. We start by taking data from the positioning of the person. With this aim we use the scanning by laser scanning of the entire contact surface of the seat to be developed. Two ways of obtaining data have been used: on the one hand, a physical model made of plaster, provided by physiotherapists, and on the other hand by using a pressure blanket, with which we can locate those areas with greater or lesser pressure in order to provide more or less foam filling and improve the comfort of the person. With the obtained skin from the digitized model and the CAD3D modelling, we designed the envelope that holds the whole seat, considering the requirements of the person brought up by their caregivers. In addition, the anchors to the external elements have been contemplated, which must be compatible with those of a specific auxiliary wheelchair. Once the whole set was designed, the topological optimization of the seat was proposed, with the aim of reducing the overall weight as much as possible. This improvement process allows the obtainment of a chair adjusted to the initial design proposed and that meets the requirements regarding the structural strength, but that is also optimised in its design to reduce the amount of material used in its manufacture to the minimum, and also enables the reduction of support material during its 3D printing and an additional reduction of its internal density by the use of filler structures generated by the 3D printing system. In addition, it will facilitate the handling of the seat by the users. The SolidThinking Inspire application has been used for the structural optimisation. Thanks to the use of Additive Manufacturing, its geometric complexity is not a problem. It is worth noting that, after optimizing the total weight, it has been reduced by 55.77%,­ maintaining the resistance of the whole and the initial load hypothesis. Finally, the simulation has been proposed by applying a load higher than that foreseen one, in order to compensate the subsequent internal emptying of the piece related to the filling pattern chosen in the selected 3D printing process, Fused Filament Fabrication (FFF). To make the manufacturing of the model as simple as possible, a one-piece printing has been foreseen so, the solution does not require auxiliary elements or assembly parts. 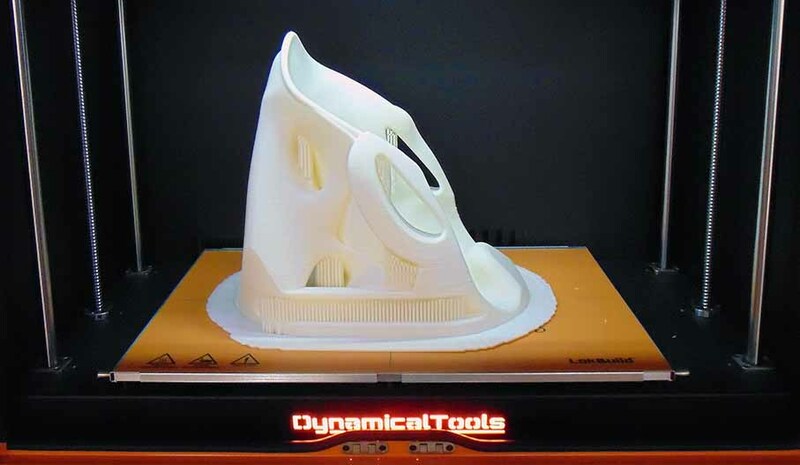 Due to the dimensions of the final design and the resistance and cost requirements, the FFF technology has been considered as the most suitable solution, using our DT600+ printer with the PLA3D870 printing material from the company Smartfil. Finally, a thermal treatment has been applied to the material after the manufacturing, which has allowed to improve its performance in order to achieve equal or higher mechanical properties than a commercial ABS. The external dimensions of the seat are 430 x 345 x 385 mm; the printing time was 110 hours using 4700 g of plastic material. The internal filling factor of 20% has allowed an additional weight reduction of more than 50% compared to the already optimized design. Finally, in order to achieve a more attractive piece appearance, an improvement in the surface quality and cleanliness, a priming and painting process was applied. Afterwards, the only thing that is needed is to match the product to the textile protections that improve the user comfort. Therefore, it can be demonstrated. by means of this real example, that, through the application of Additive Manufacturing, it is possible to carry out fully customized projects. This product will be exhibited at the AIJU stand during the ADDIT3D (A59-Pavilion 4), the professional fair of Additive Manufacturing and 3D Printing, which will be held in Bilbao from May 28 to June 1, 2018, integrated within the exhibition space of the prestigious BIEMH 2018, Biennial of Machine-tool.